(clockwise from the left) James Carrington (Four-Eyed Moe), Lorenzo Rush Jr. (Big Moe), Sean Anthony Jackson (Eat Moe), Kevin James Sievert (Little Moe) and Shawn Holmes (No Moe) in rehearsal for Skylight Music Theatre’s production of Five Guys Named Moe January 25 – February 10. Photo by Ross Zentner. "Five Guys" Has the Joint Jumpin'! Maybe you’ve never heard of the “King of the Jukebox” Louis Jordan. But you’ve surely spent some time drinking a little too much, nursing heartbreak after a fight with the one you love, finding refuge in songs on the radio that seem to express everything you feel in that moment, but are too wrecked to say yourself. This is the premise of Skylight Music Theater’s current production, “Five Guys Named Moe,” a celebration of Jordon’s greatest hits of swing jazz, R&B, boogie-woogie, rockabilly, blues and early rock ‘n roll, onstage in the Cabot Theatre through February 10. In this gorgeous revue, Nomax (the extremely versatile Gavin Lawrence) is the besotted bum who’s on the outs with his girlfriend Lorraine, after forgetting her birthday and having a day-late card shoved back in his face. Leaning heavily on a bottle, he stumbles around his house in the wee hours, bemoaning his state and turning up the radio to listen to Louis Jordan’s “Early in the Morning,” echoing the “ain’t got nothing but the blues,” lyrics. But when the announcer starts talking to him directly and the radio begins to flash an array of neon colors, it’s easy to see some magic is in store. Enter the five Moes in a cloud of supernatural haze, to teach Nomax some lessons about love, respect, and how to win back his sweetheart. The string-bean skinny Eat Moe (Sean Anthony Jackson) dances like his joints are made of jello and predictably complains that he’s hungry throughout the show. The bespectacled Four Eyed Moe (James Carrington) and bald No Moe (Shawn Holmes) are familiar faces from director Malkia Stampley’s productions of “The Black Nativity,” back for a lot more smooth moves, harmonies and smooth solos. Carrington, in particular, gives it his all to get the joint jumpin’ by encouraging the crowd to get into the act. (Yes, there are lots of opportunities for audience participation.) He teaches each section of the theater the chorus to “a new calypso be bop” and then leads a singalong. Be advised that if you are on an aisle seat, you will also be cajoled into joining a conga line at the end of act 1. Lorenzo Rush Jr. (Big Moe), Sean Anthony Jackson (Eat Moe), Shawn Holmes (No Moe), James Carrington (Four-Eyed Moe), Kevin James Sievert (Little Moe) and Gavin Lawrence (Nomax) in rehearsal for Skylight Music Theatre’s production of Five Guys Named Moe January 25 – February 10. Photo by Ross Zentner. But wait, there’s more Moes. Kevin James Sievert is Little Moe. Clad in a plum plaid shirt and gold jacket he’s the high tenor of the group, with a killer shimmy. And then there’s Big Moe, who really has to be seen to be believed. Played with show-stopping energy and style for days by Lorenzo Rush Jr., it’s hard to take your eyes off this Moe, and not just because — living up to his name — he towers over some of his castmates. In a red suit with white suspenders he is charisma, grace, emotion and energy, bound together by a knock-out voice. It’s little wonder he won a Jeff Award for his performance of the same role last season at the Court Theater in Chicago. His renditions of “What’s the Use of Getting Sober,” and “Caldonia” are especially inspiring. These are only exceeded by the full cast number “Is You Is, or Is You Ain’t My Baby?” a few songs shy of the actual foot stomping finale. When the cast stands stock still and sings that silky and haunting melody it will give you chills. Choreographer Lanette Costas keeps the guys moving for most of the show, in inventive combinations that easily fill the stage. And her cast is on point in the execution, from jumps and splits to slick tap dance and even a limbo or two. 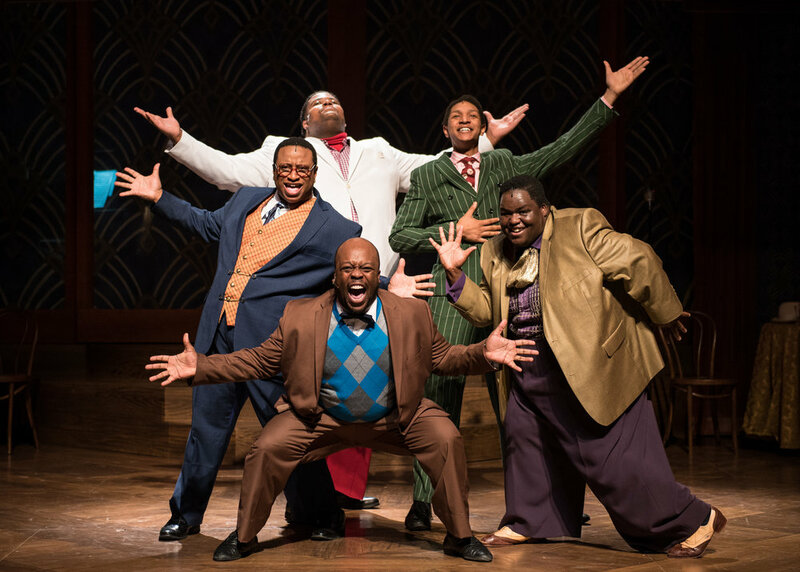 The set, designed by Tara Houston, does of good job of foregrounding the Moes, their fabulously full colored suits (design by Samantha C. Jones) and their energetic acts. Drawing on art deco style from the ‘30s, when Louis Jordan began performing, the stage is dominated by the dark wood curves of an old-time radio, filled in with gold patterns and antique violet shades. Of all the jukebox musicals (and there are many) this might be one of the best, simply because it doesn’t pretend to be more than it is. There’s not much plot shoehorned into this musical; it’s a revue that includes a wide variety of toe tapping songs from other eras, telling stories about misadventures, heartbreak, dating dos and don’ts, words to the wise, and a few silly songs that are just fun to listen to. Performed by a solid cast and a swinging five piece band, it’s a warm diversion for a cold Wisconsin night. Postscript: Kudos to Artistic Director Ray Jivoff and “Five Guys” director Malkia Stampley for making gender parity a priority with this production. The entire cast is made up of six guys, so the Skylight made the conscious decision to use a predominantly female production team, including Set Designer Tara A. Houston, Choreographer Lanette Costas, Lighting Designer Latrice Lovett, Music Director Christie Chiles Twillie and costume designer Samantha C. Jones. Congrats for bringing diverse voices and perspectives to the table.